Tofu can be hit or miss. Some people don't love the texture but freezing your tofu is a great way to change the texture without much extra effort. Freezing tofu removes the excess water which makes tofu able to soak up your marinade better. It also makes your tofu less 'sponge-y' and gives it a sort of 'chewier' texture. I take my tofu and cut a slit into the top of the plastic packaging and drain it over the sink. Then, with the tofu still in its package, I place it into the freezer. 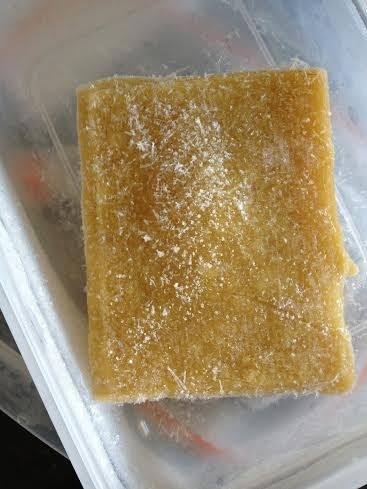 Let it freeze- this takes several hours, depending on your freezer. When tofu comes out of the freezer it will turn into an amber color. Don't be alarmed! Some tofu gets only slightly yellow, some gets pretty dark. That's normal and it will fade back to its normal color. Let your tofu thaw out. I like to leave tofu in the freezer over night and then place it in the fridge in the morning, by dinner it will have thawed out and I can cook with it!